They boldly go where other men just look like they're going. 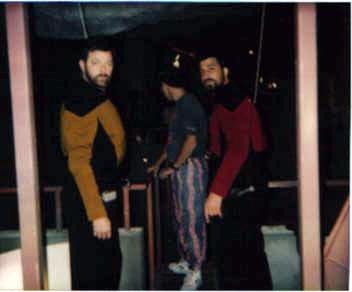 Mark Riccardi and Dennis "Danger" Madalone are "Star Trek" stunt men. "It's fun, and as long as we can keep it rolling, that's great," said Riccardi, who like Madalone, grew up in South Plainfield. Riccardi's final frontier? Doing the dirty work for Johnathan Frakes, the actor who plays Cmdr. William Riker on "Star Trek: The Next Generation." Madalone is the stunt coordinator for "The Next Generation" as well as the latest "Star Trek" spin-off: "Deep Space Nine," supervising all the stunt work on the two series. Both of them show up from time to time in non-speaking roles.